During the election campaign of 2008 before he was elected president, Barack Obama made an artificial distinction between the supposedly “just war” in Afghanistan and the unjust war in Iraq. In accordance with the flawed distinction, he pledged that he would withdraw American troops from Iraq, but at the same time, he indicated that he would increase the number of US forces stationed in Afghanistan. The unilateral intervention in Iraq in 2003 by the Bush Administration was highly unpopular among the American electorate. 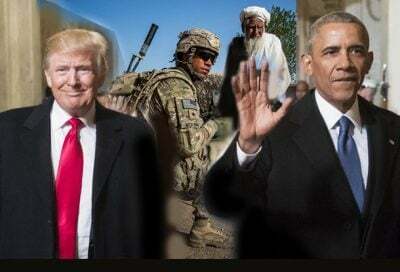 Therefore, Obama’s election pledge of complete withdrawal of the US troops from Iraq struck a chord with the voters and they gave an overwhelming mandate to the ostensibly “pacifist” contender during his first term as the president. In keeping with the election pledge, President Obama did manage to successfully withdraw American troops from Iraq in December 2011 during the first term as the president, but only to commit thousands of American troops and the US Air Force to Iraq just a couple of years later during the second term as the president when the Islamic State overran Mosul and Anbar in early 2014. The borders between Iraq and Syria are poorly guarded and highly porous. The Obama Administration’s policy of nurturing militants against the Syrian government for the first three years of Syria’s proxy war from 2011 to 2014 was bound to backfire sooner or later. Regardless, when President Obama decided to withdraw American troops from the unjust war in Iraq, at the same time, he pledged that he would commit additional American troops and resources into the purportedly “just war” in Afghanistan. Consequently, the number of US troops in Afghanistan spiked from 30,000 during the tenure of the neocon Bush Administration to more than 140,000 during the term of the supposedly “pacifist” Obama Administration. No one can dispute the assertion that the notions of “just wars” and “good militants” do exist in the geopolitical lexicon; empirically speaking, however, after witnessing the instability, violence and utter chaos and anarchy in the war-ravaged countries like Afghanistan, Iraq, Libya, Syria, South Sudan, Somalia and Yemen, the onus lies on any interventionist hawk to prove beyond doubt that the wars and militants that he justifies and upholds are indeed just and good. More surprisingly, however, if Afghanistan was perceived as an occupied country by the gullible audience of the mainstream media during the years of Soviet occupation from 1979 to 1988, then how did it become an independent state after the American occupation of Afghanistan since 2001-onward? Furthermore, if the Afghan so-called “mujahideen” (freedom fighters) nurtured by the Reagan administration with the help of Pakistan’s intelligence agencies and Saudi money constituted a legitimate resistance against the Soviet occupation of Afghanistan, then by what principle of consistent logic, the resistance against the American occupation of Afghanistan can be reviled as “terrorism”? In international politics, the devil always lies in the definitions of the terms that are employed by the spin-doctors of the foreign policy think tanks and the political commentators of the corporate media. And the definition of the term “terrorism” has been deliberately left ambiguous by the Western powers to use it as a catch-all pretext to justify their military presence and interventionist policy in the energy-rich countries of the Middle East. After invading and occupying Afghanistan and Iraq and when the American “nation-building” projects failed in those hapless countries, the US policymakers immediately realized that they were facing large-scale and popularly rooted insurgencies against foreign occupation; consequently, the occupying military altered its CT (counter-terrorism) approach in favor of a COIN (counter-insurgency) strategy. The root factors that are primarily responsible for spawning militancy and insurgency anywhere in the world are not religion but socio-economics, ethnic differences, marginalization of disenfranchised ethno-linguistic and ethno-religious groups and the ensuing conflicts; socio-cultural backwardness of the affected regions, and the weak central control of the impoverished developing states over their remote rural and tribal areas make them further susceptible to armed insurrections. Additionally, if we take a cursory look at some of the worst insurgency-wracked regions in Asia and Africa, deliberate funding, training and arming of certain militant groups by regional and global powers for their strategic interests has played the key role. Back in the 1980s during the Soviet-Afghan War, the Afghan jihadists did not spring up spontaneously out of nowhere. The Western powers with the help of Saudi money and Pakistan’s intelligence agencies trained and armed the erstwhile “freedom fighters” against their archrival the former Soviet Union. Those very same Afghan jihadists later mutated into al-Qaeda and the Taliban. Similarly, during the proxy wars in Libya and Syria, the Western powers with the help of their regional client states once again trained and armed Islamic jihadists and tribal militiamen against the governments of Colonel Gaddafi and Bashar al-Assad. Notwithstanding, on November 9, Russia hosted talks between Afghanistan’s High Peace Council, the members of the Taliban from its Doha, Qatar office and representatives from eleven regional states, including China, India, Iran and Pakistan. The meeting showcased Russia’s re-emergence as an assertive global power and its regional clout. At the same time when the conference was hosted in Moscow, however, the Taliban mounted concerted attacks in the northern Baghlan province, the Jaghori district in central Ghazni province and the western Farah province bordering Iran. In fact, according to a recent report by the US Special Inspector General for Afghanistan Reconstruction (SIGAR), the US-backed Kabul government only controls 55% of Afghanistan’s territory. It’s worth noting, however, that SIGAR is a US-based governmental agency that often inflates figures. The Taliban have managed to overrun and hold vast swathes of territory not only in the traditional Pashtun heartland of southern Afghanistan, such as in Helmand, but have also made significant inroads into the northern provinces of Afghanistan which are the traditional strongholds of the Northern Alliance comprising the Tajik and Uzbek ethnic groups. The main factor behind the surge in Taliban attacks during the last couple of years appears to be the drawdown of American troops which now number only 14,000, and are likely to be significantly scaled back after Donald Trump’s announcement of withdrawal of American forces from Syria and the reports of Trump’s decision – which hasn’t been officially announced yet – that the Trump administration has decided in principle to reduce the number of US troops in Afghanistan by at least several thousand.